The main gripe with Frank Iero’s current material is that he can often seem to favour scrappiness over real songcraft. That’s not to say that’s entirely a bad thing – his two post-My Chemical Romance efforts still stand as solid displays of a surprisingly tight garage-punk nous, and even if Death Spells is a lot more divisive, there’s definitely a fanbase for it. The issue comes when that scrappiness is put in such high focus, and Keep The Coffins Coming does exactly that. Teaming up with legendary grunge producer Steve Albini might be worth shouting about, but otherwise, a release of four tracks clocking in at only twelve minutes can’t do much else than scream of a stopgap to tide over the diehards for a little while longer. Even then, that’s not exactly true given how I’m A Mess leads off, making a return from last year’s Parachutes. On the bright side, it’s not a bad track, capturing the ideal midpoint between unhinged recklessness and something closer to melodic, grimier pop-punk, but it still feels like something of a cop out, particularly when the only other track of note is the grungy, morose BFF that sways along with Iero’s brittle vocals to capture this EP at its best. On the flip side though, No Fun descends into the sort of fuzzed-out mayhem that borders on unlistenable, let alone unlikeable, and You Are My Sunshine really slams on the brakes, a five-minute trudge across a sluggish drumbeat with a guitar line that only picks up some real personality when transitioning into the occasional fuzzy solo. It definitely feels like a pair of filler tracks tacked onto what could have been a perfectly solid single release, but as an EP, Keep The Coffins Coming becomes swamped in how inessential it all is. It’s not a total waste of time by any means – the two good tracks are worth listening to at the very least, and twelve minutes is hardly a marathon runtime – but there’s no reason that this had to exist. Iero completionists could do worse than to pick this up, but it’s virtually guaranteed that this won’t be remembered in about a month’s time. 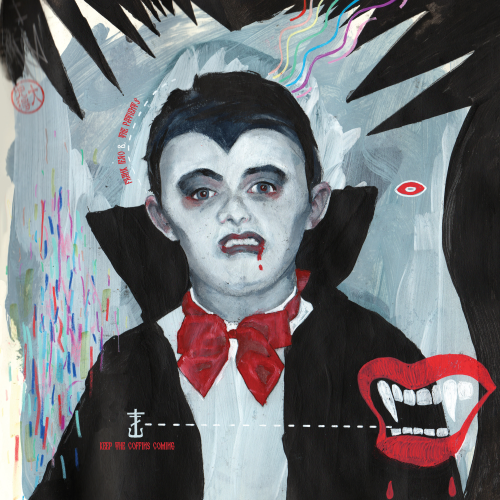 ‘Keep The Coffins Coming’ by Frank Iero And The Patience is released on 22nd September on Hassle Records.